All My Tomorrows is a wonderful, melodious trip down memory lane and a crash course in the prototype for the perfect collection of American standards. 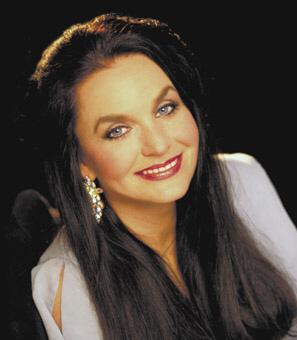 The only "country" connection to this breathless collection of timeless classics is the fact that they are sung by one of the most unique gems in any genre of music; the superlative and beautiful Crystal Gayle -- sister of the indisputable queen of country, Loretta Lynn. With an impressive list of platinum and gold records to her credit, the twice voted CMA "Female Vocalist Of The Year," Grammy winner for "Best Female Vocal Performance," and three time ACM "Top Female Vocalist" easily made her way into the hearts of mainstream music lovers across the country to win three American Music Awards for "Favorite Female Artist." The reason is clearly evident when you hear her wrap her magnificent vocal chords around a tune penned by the great Irving Berlin or the peerless Ray Charles. This album is sure to solidify her place in the hearts of music lovers everywhere and make her the undeniable queen of great music ... period. It is impossible to choose a favorite song from the album when you are awash in heavenly waves of nostalgia and placated by such great classics as "Cry Me A River," "It Had To Be You," and "What'll I Do." Being a fan of the big band era, I was swept down memory lane to a tranquil place in my heart and soul that I hadn't visited in many years. Gayle would have been right at home singing with the Glen Miller or Tommy Dorsey bands and one thing is crystal clear after listening to this album; whether it is in the Opry or in Vegas -- Ms. Gayle is right at home on any stage, singing any song from any genre of music. The most difficult thing about writing this album review was writing. As each new song came on I found myself happily singing along and totally forgetting to write. Then all of a sudden I would realize the album was over. So, I'd start it over again. Sing along. Get transported down memory lane. Forget where I was and what I was supposed to be doing; opps ... I'd start again. Fourteen of the greatest songs ever written; sung by an angel whose voice took me back in time to a place I didn't want to ever leave. Dang. It took me four days to write this review. Accompanied by a single guitar or a full orchestra, it is her superlative voice that shines. She is one of a kind and living proof that good things can get better and the very best things do improve over time.